A Rulebook For Your Organization - Part 2. Most organizations seem to have an itch for logging timecards of employees. What time did they enter the workplace? When did they leave? Did they spend nine hours at work? Policing is stupid. Number of hours you spend at work have no direct correlation with your productivity. If you are starting an organization and have an unending itch for logging something, start out by logging the number of hours everyone in your organization spends on meetings. Nine programmers gather for a 'quick discussion' which blows from a five minute discussion to a one hour meeting is nine man hours wasted. Being in a meeting is worse than not being in office. When you are not at your workplace there is a possibility you are working from somewhere else. When you are out having fun, your chances of coming back fresh and putting in more productive hours are high. When you are in a meeting, we know for sure, you are not working and you are getting drained out. Of all the things that most typical organizations log or care about (time spent in office, processor cycles, dress code), most things do not have any direct correlation with developer productivity. Number of hours spent in meetings per day is one Metric however, which does have a strong direct correlation to productivity. If you are not actively measuring and logging this metric your organization is a classic case of an ostrich burying its neck in the sand. If you are logging this metric, chances are that the three hundred unproductive man hours that you spent on meetings last month are going to make you lose some sleep, specially when the reports are in your face and that is a good thing. Now its time to do something about it. 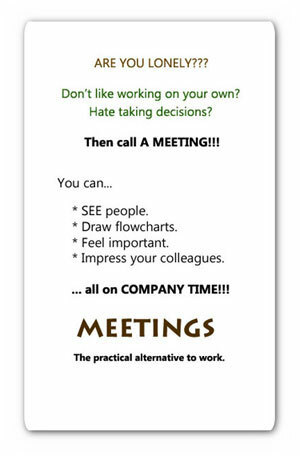 That something is not another meeting on how you can reduce your meeting time. Can a ten minute detailed email do what an hour long meeting would have taken? Can you use screen capturing utilities to do videos to give to the clients instead of getting the entire team to demo a new feature to them? Are there any better ways to capture and pass information than people being hustled into meeting rooms. Ask the difficult questions that you avoided for months or even years. If you can spend three hours to do a video and avoid a one hour meeting, you should. Videos typically just require one person to create them. Videos aren't intrusive. Videos are permanent and reusable. You are much better better off investing the three hours, rather than inviting ten people in a meeting, interrupting their flow and blowing up the talk time of your organization to ten hours. Meetings are not just toxic. Meetings are emotionally stressful. Meetings interrupt flow. So here is a golden rule for your startup: Log your meetings. See how man hours you drain into sitting in meeting rooms and talking and then rage your very own organizational war against meetings.